The applet may suggest several related properties of a quadrilateral formed by the centers of the squares constructed on the sides of a quadrilateral. 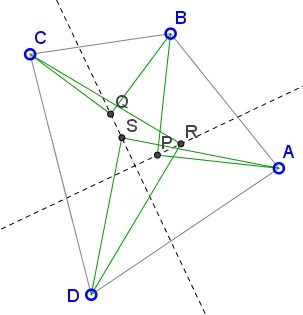 The quadrilateral PQRS is orthodiagonal and the diagonals are equal in length. 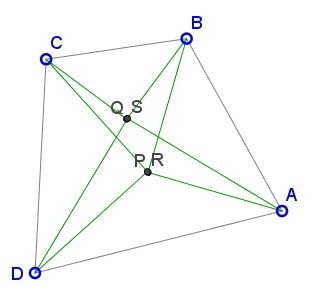 If the squares are drawn on the sides of quadrilateral with successive apexes P, Q, R, S - internal to the quadrilateral and neither P and R nor Q and S coincide, then PR is orthogonal to QS. If the squares are drawn on the sides of quadrilateral with successive apexes P, Q, R, S - internal to the quadrilateral, then P and R coincide iff Q and S coincide. If the squares are drawn on the sides of quadrilateral with successive apexes P, Q, R, S, so that P and R are internal whilst Q and S are external to the quadrilateral, then if P, Q, S are collinear then so are R, Q, S. In particular, if P and R coincide then P, Q, R, S are collinear. Complex numbers come in handy to help solve this problem. 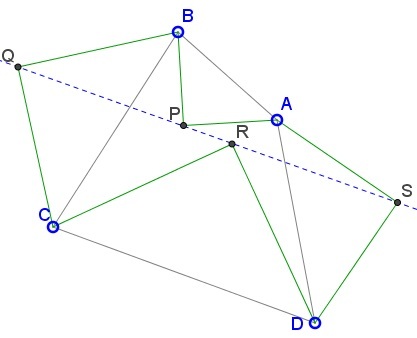 Let a, b, c, d be the complex numbers corresponding to the vertices A, B, C, and D and, similarly, p, q, r, s for the points P, Q, R, S. In general, we underscore this relationship as A(a), B(b), etc. s = (1 - μ)d + μa. bd = d - b.
qs = (1 - μ)bd - μac. (7) i(1 - μ)ac + iμbd = (1 - μ)bd - μac. (8) μ/(1 - μ)·ac = bd. But μ/(1 - μ) = (1 + i)/(1 - i) = (1 + i)2/2 = 2i/2 = i. So (8) implies i·ac = bd. This is of course assuming neither pr = 0 or qs = 0. Now, what if pr = 0 say? Then (6) implies that also qs = 0. Obviously, (6) also yields the reversed implication. s = μd + (1 - μ)a.
P = R is still equivalent to (4). We observe from (2') that (p + r)/2 = (q + s)/2, and, since p = (p + r)/2 = r iff P = R, it follows that if P = R then it serves as the midpoint of QS. When all four triangles have the same orientation it was shown elsewhere that PR and SQ are equal and perpendicular. However, the argument falls through when either has zero length.